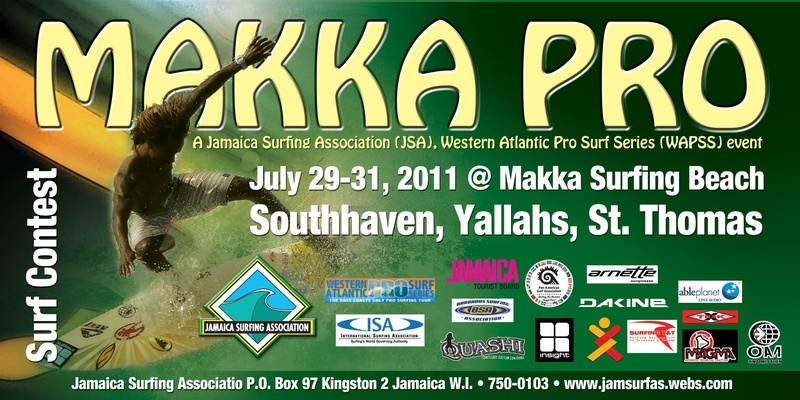 The 2011 Makka Pro surfing contest being hosted by the Jamaica Surfing Association at the Makka Surfing Beach at Southaven, Yallahs Saint Thomas from the 15-17 July, is shaping up to be one of the biggest ever surf events in Jamaican surf history with the official sponsorship of the Jamaica Tourist Board! The event is attracting enquiries from pro surfers from Trinidad to New York as this year’s Makka Pro is the 3rd event in the 2011 Western Atlantic Pro Surf Series. With the recent successes by Jamaican surfers on the regional and international stages, the surfing world is now taking Jamaica’s surf much more seriously. The Makka Pro now in its 5th year is demonstrating that the Jamaica Surfing Association is committed to ensuring Jamaica becomes recognized as a genuine destination for adventurous surf travelers. The JTB recognizes this fact and has committed to sponsorship of the Makka Pro and will be actively working to promote the event and by extension, the sport of surfing in Jamaica. “Jamaica enjoys an enduring legacy of excellence in sport and given its international renown as a first class tourist destination, we are in an advantageous position to carve out a niche for ourselves in the lucrative and fast growing sports tourism market” said JTB Deputy Director of Tourism Cruise, Events and Attractions Mr. Jason Hall. “The creation and growth of this event over the past five years is putting the alternate tourism spotlight on a region of Jamaica that has been neglected for a long time…..” Said JSA President Billy Wilmot “…now the eastern end of our island can stand up and present world class extreme sporting attractions and vacation options that cannot be offered by Jamaica’s traditionally promoted tourism products at the western end of the island… a genuine niche market which is already attracting surf tourism clients.” If you’d like to turn your hobby into a lifestyle a little closer to home, why not look into Huntington Beach Homes, and you could live in the surfing capital! More and more local businesses are now coming forward interested in being a part the major annual calendar event for the Southwest Saint Thomas community. Citizens are seeing surfing as the foundation for establishing tourism as a viable business option for their area.